No Trucker Should be Without. Blue Ridge Overland Gear does a great job introducing the Tembo Tusk Skottle Bag. RoadTrucker recommends you visit their website for some awesome recipes to cook in your Skottle. They have a recipe for BBQ Sloppy Joes, Eggs Benedict, Pizza, Steak Fajitas, BBQ Chicken, and one for Spaghetti and a host of others to help you eat right on the road. Visit them a https://www.youtube.com/ and search for "Mountain State Overland - Field Recipes".. And if you try and like one of their recipes, send them an email and let them know your thoughts. Incidentally Blue Ridge Overland Gear products are Made in the USA. Thanks to Mountain State Overland’s team cook, Jamie shows you how to whip up a fish taco recipe offering a baja-style dinner just about anywhere. Cooking on a Tembo Tusk Skottle makes this entree an elegant delight at your home away from home. Why a Skottle? Eating on the road has always been less than optimal, especially with the 12 Volt lighter being so limited in it’s ability to draw enough current to provide kitchen type cooking. Now there is an alternative that cooks like an outdoor Grill or Cast Iron kitchen skillet. So get out of your Truck, toss the legs on the Skottle, throw on some veggies and meat and Voilà, home cooking at it's best. Cold sandwiches maybe ok, but if your life is on the road, then why not make it as enjoyable as you can? Take your full break, learn to cook a few recipes you like and instead of wolfing down a quick sandwich and waiting for your break to end, enjoy expanding your dinning pleasure trying new recipes to your own taste. There are plenty of easy recipes to choose from and You Tube makes it a snap, even if you can't cook. Just search for "Tembo Tusk Skottle Recipes". How about a nice chicken quesadilla, hot off the grill? You can even spice up that bologna sandwich with a little heat, lettuce, tomato and mayo. The Skottle Grill is made in the USA and comes already pre-seasoned so you can cook on it just as soon as you can get it out of the bag. It heats fast and cools fast and best of all you can cook just about anything you can think of. Yes, even spaghetti, pizza and cookies. The TemboTusk Skottle can heat up to 10,000 BTUs. It just might be the best answer to a Trucker’s need for healthy food on the road. It cools down fairly quickly (about 10 minutes) and the more you use it the better it cooks. It is like the old cast Iron skillets that seem to cook better the longer you used them. "Thank you so much for the Skottle maintenance and cooking tips email! That was very unexpected and above and beyond normal customer service. I really appreciate that you’ve put this together for customers!" So what is a Skottle anyway? 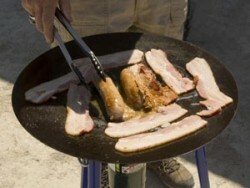 The Skottle is basically a shallow dish on a burner, that cooks similar to a grill or skillet. It is designed around an inexpensive Colman PerfectFlow Single Burner, which is also included in the price. 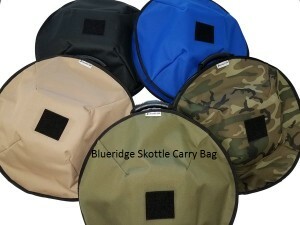 The Skottle Kit also includes a convenient carry bag. 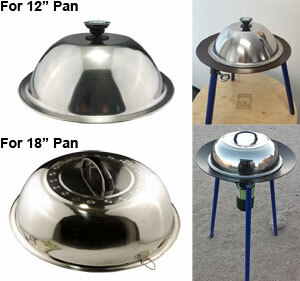 It’s small footprint make it the ideal on the road cooking appliance. 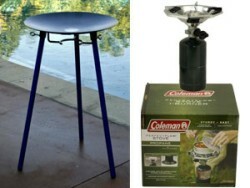 The 10,000 BTU high-performance Coleman burner, was designed to help reduce your cooking time. Coleman’s PerfectFlow regulator provides a consistent steady flow of fuel, keeping your cooking consistent in cold weather or when propane is getting low. 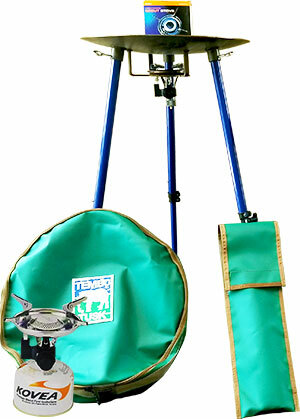 Carry bag holds the Skottle, burner, and up to 4 gas bottles. Legs Have a Separate Storage Bag with a Velcro Closure. 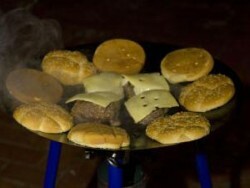 Cook burgers, Hash browns, Pizza, Stews, Steaks, and so much more. Mountain State Overland team cook, Jamie, assembles a red lentil and vegetable stew recipe from "The New Blue Ridge Cookbook" by Elizabeth Wiegand. http://www.elizabethwiegand.com). You can buy her book on Amazon. Jamie crafts a sweet potato biscuit recipe, also from "The New Blue Ridge Cookbook" by Elizabeth Wiegand. Visit her website at (http://www.elizabethwiegand.com) or buy her book on Amazon. Mountain State Overland team cook, Jamie, assembles an easy and quick deli-style pizza using a Tembo Tusk Skottle.